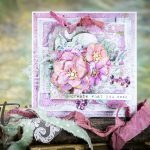 Teresa created this simple and easy card filled with beautiful lacy scallops and embossed details from A2 Card Creator A2 Floral Ribbon Threader. She used rich dark pink paper with a softer pink tone and white for a perfect Valentine look. She layered the die cuts with 3D Foam Squares to show off its details. Cut white cardstock to 4½ x 5¾.  x 5. Glue on the pink dotted paper. Cut/emboss A2 Floral Ribbon Threader Die #3 (the smallest size die is #1) with dark pink patterned paper through the Grand Calibur Machine. Nest Die #2 and #3 together to cut/emboss with pink dot paper. Measure around the center behind the dots with a pencil and cut with scissors or craft knife to create a window. Adhere the two pieces together. Then adhere to the base with 3D Foam Squares for more dimension. Cut/emboss Die #1 with white cardstock. 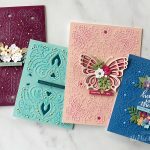 Stamp sentiment in black ink and heat emboss with clear embossing powder. Center on to card with 3D Foam Squares. Tie a pink ribbon around the entire top piece with a knot on left side. Add tiny pearls to the outside to finish. 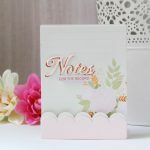 By cutting the inside rectangle out, you can use the matting basics sets that coordinate with all of the Card Creator dies. It’s one of my favorite dies and there is so much that you can do with it.